I now have a burning desire to write a children’s book entitled “Cody and the One-eyed Cat.” In my mind it’s going to be a top seller. @Ami, Please do. Make sure Cody has really big biceps. Because that’s what kids’ books really need. we have a cat that likes to sleep on us. Bear is 14lbs and purrs all night long. @saramd, BEAR! I didn’t realize how much I missed cats purring until these two furballs joined us. @Casey, Nothing say’s love like kitty purrs. I think we will always have a cat around. LOVE those nighttime pictures. I’ll sit still for hours when my cat decides to grace my lap with his presence. Also! Completely unsolicited advice alert (so please ignore at will! in case… you know… you hadn’t realized you could ignore whatever you wanted??). Hmmm. In any case – as the owner of a shedding monster kitty who HATES to be brushed, have you tried the Furminator? It’s completely ridiculously expensive for a cat brush, but works SO well (as in, 5 strokes and grooming is done for a month) and my cat doesn’t hate it quite as much as a regular brush. LIFE CHANGING. Your mileage may, of course, vary. Plus, I LOVE the idea of a “kitty spa day”. Makes me giggle. @Lindsay, We have one of those! He hates us using it on him. Two eyes can put up with it but Wink? No way. That should go to show how desperate we were to solve this little issue. A $50 CAT COMB. @Casey, Bummer! Ah well, I had to try suggesting it. But, kitty spa day, it is! I’m sure Wink looks fab now. I have 2 cats and one I have to get groomed by a professional. I’m not that brave! 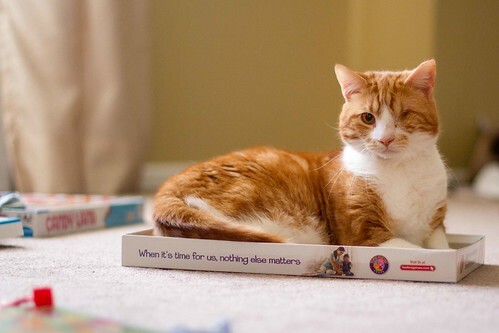 I think the photo in the game box is especially fitting with the slogan “When its time for us nothing else matters” underneath!! ‘Time to attach swiffers to the baby’- Thanks for making me laugh this morning!